Given the extensive changes that Greek law has undergone the past 15 years or so, the purpose of this third edition is twofold: first, to bring the text up-to-date; and second, to complement the text with the presentation of additional areas of law that had not been addressed previously. The third-edition chapters are current at least as of June 2006. In many instances, additional information was subsequently inserted by the authors, bringing the updating up to late December of the same year. 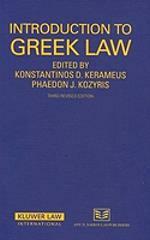 Bearing in mind that the present publication remains, to this day, the sole comprehensive summary of Greek law in a language other than Greek, let us wish that modern-day legal professionals will consult this third edition with the same level of interest and enthusiasm as has been the case with the previous two.